Preheat oven to 200*C. Line a swiss roll baking tin with greaseproof paper and spray and cook the greaseproof paper. – Sift flour, baking powder, salt three times. – Whisk eggs and sugar in a bowl until light and creamy. It must be very thick. – Add water and vanilla essence and fold in dry ingredients with a metal spoon or spatula. – Have a damp tea cloth ready sprinkled with castor sugar. 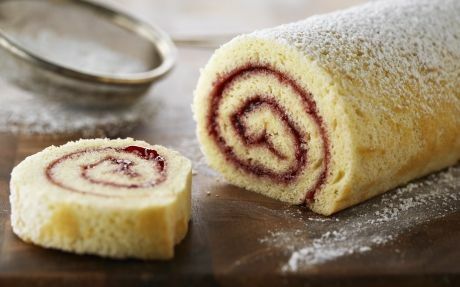 Immediately turn swiss roll onto tea towel. Trim edges and roll. – Unroll swiss roll and spread with whipped cream. Note: Never overbake a swiss roll as this results in cracking during rolling. Speed is essential to get an unbroken and evenly rolled cake.